The idea that cold can target fat cells—without damaging the skin or surrounding tissue—was the insight behind Cryolipolysis®, the proven science on which the CoolSculpting® procedure is based. The CoolSculpting® procedure safely delivers precisely-controlled cooling to gently and effectively target the fat cells underneath the skin. Treated fat cells are crystallized (frozen), then die. Over time, your body naturally processes the fat and eliminates these dead cells, leaving you more sculpted. Many of us have stubborn fat despite diet and exercise. 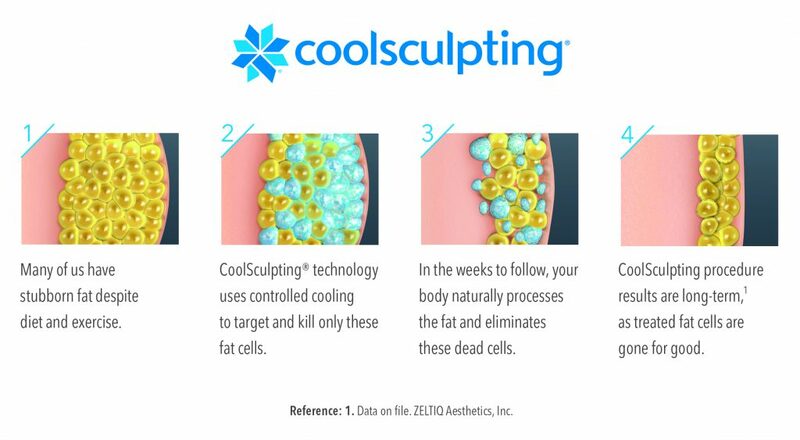 CoolSculpting® technology uses controlled cooling to target and kill only these fat cells. In the weeks to follow, your body naturally processes the fat and eliminates dead cells. CoolSculpting® results are long term* because treated fat cells are gone for good. Fat cells that are frozen during the CoolSculpting® procedure gradually die off and leave the body through the body’s natural elimination process. That’s why the results are long-term—the fat is gone for good! Untreated areas will have no change in fat cell distribution.